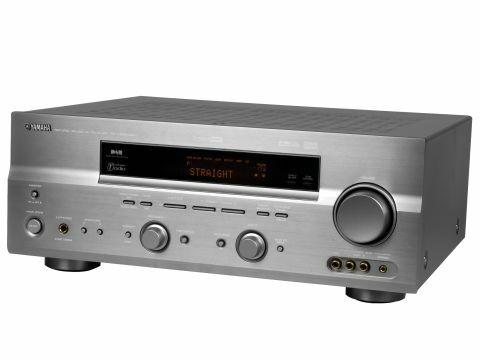 The Yamaha RX-V559DAB is one of the first surround receivers to incorporate a DAB tuner alongside built-in FM and AM tuners. The Digital ToP-ART specification means that the RX-V559DAB incorporates some of the brand's top-draw electronics and is rated at 95W output to each of its six surround sound channels. Unlike the similarly priced Onkyo TX-SR674E, the Yamaha doesn't include any HDMI connectivity for synchronising and switching digital video and digital audio signals, but component video sockets are included and composite and S-video signals are automatically up-converted for the best signal quality to your TV. S-video signals can also be down-converted to composite video, and there's an audio delay adjustment to compensate for lip-synching errors. Surprisingly, the RX-V559DAB doesn't incorporate Yamaha's Parametric Room Acoustic Optimizer (YPAO) to automatically optimise its settings to your specific seating position and speaker placement. It's a bit of a disadvantage for beginners, but the onscreen setup options are fairly self-explanatory and allow you to easily customise the receiver to your specific layout and audio tastes. Yamaha likes to bundle its own Digital Signal Processing (DSP) modes into its receivers. The RX-V559DAB is no exception and incorporates nine DSP variations on a home cinema theme and five on a hi-fi theme. Component images routed straight through the Yamaha show no obvious sign of degradation, and X-Men: The Last Stand demonstrates vibrant images with pin sharp details. Up-converted signals lose a little detail and colours are less vibrant, but these are small sacrifices for the convenience of synchronising picture and sound switching from all your external sources. Sonically, the Yamaha has a reassuringly solid sound while movie soundtracks have plenty of punch. Bass notes have great power but are extremely well controlled, and the Yamaha hangs on to movie soundtracks with a vice-like grip. It does a spectacular job at conveying movie atmospherics and its refined sonic signature is very easy on the ear. Stereo performance with CD playback is very effective, and selecting the Straight Mode bypasses any additional circuitry for a noticeably smoother sounding stereo performance. DAB radio performance is impressive too, with only a slight over crispness to concern radio enthusiasts, and the Yamaha effortlessly receives digital stations without any hint of interference. iPod playback hasn't been overlooked either and an add-on YDS10 iPod dock can be purchased for £80. Playback automatically activates Yamaha's enhanced music mode and the handset provides basic iPod control. This Yamaha receiver really delivers where it counts. Its features may seem less sophisticated than many of its rivals, but performance is high and the RX-V559DAB is anything but basic.